Info Josh Frydenberg was elected to the Australian Parliament in 2010 as the Member for Kooyong. He is the seventh person since Federation to hold this seat. Josh was born in 1971 and raised in Kew, where he spent many of his formative years and where his grandparents lived for more than 30 years. At university Josh was involved in a number of community activities. He was both a volunteer reader for radio station 3RPH (Radio for the Print Handicapped) and a volunteer coach for the Kids Tennis Foundation where he taught tennis to young people with an intellectual disability. In 2003 Josh accepted an invitation from the Kids Tennis Foundation’s Chairman Paul McNamee to join the board, and has been a member ever since. After leaving Canberra Josh spent a month as a jackaroo on a sheep station in South Australia before joining Deutsche Bank as a Director of Global Banking in January 2005. Later that year Josh took leave to complete a Masters of Public Administration (MPA) at Harvard University’s Kennedy School of Government, before returning in 2006 to Deutsche Bank in Melbourne. During his first term in parliament, Josh was appointed a member of the Joint Committee of Public Accounts and Audit and the Joint Select Committee on Gambling Reform. He was a co-deputy chair of the Coalition’s Productivity Priorities Working Group, and a member of a committee established by Tony Abbott to advise him on the re-establishment of the Australian Building and Construction Commission (ABCC). In September 2013, Prime Minister Tony Abbott appointed Josh to the government’s front bench as the Parliamentary Secretary to the Prime Minister, with specific responsibility for implementing the Coalition’s deregulation agenda. In December 2014, Josh was appointed to the ministry as Assistant Treasurer. In September 2015, Prime Minister Malcolm Turnbull appointed Josh to the Ministry as Minister for Resources, Energy and Northern Australia. In July 2016 Josh was appointed as Minister for the Environment and Energy. 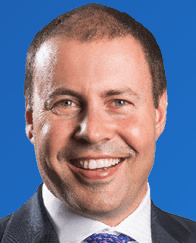 On 24 August 2018 Josh was elected Deputy Leader of the Liberal Party. He was appointed Treasurer of Australia by Prime Minister Scott Morrison. 05/18/2019 VIC MP - Kooyong ?? ?